I like to get a blood test every 3 to 4 months to make sure that everything is ok. It’s primarily to monitor my thyroid medication and iron levels. I went for this blood test on the 11th of January 2019. I was just back front Seville where I had run 120 miles the previous week and drank the most of a bottle of local good tasty wine every night. The main reason I went to the doctor was to get the flu vaccine, I just had the bloods done as I was there. I am terrified of needles so getting both an injection and having blood drawn was my worst nightmare. I had the flu vaccine in my left arm and the blood drawn from my right arm. I always get the blood taken from my right arm because the left one goes dead afterwards. The flu vaccine was very unpainful, almost unnoticeable. The bloods were fine too, I can never look but I think there were three vials. The blood left very slowly and I was sweating profusely afterwards. I’ve modified my iron supplements recently as the Feosol Complete that I used to take is no longer available. I know take one Active Iron and one Galfer every evening after running with a Yakult. As you can see from the Ferritin graph this appears to be working really well. My ferritin is up to 66, as high as I’ve ever seen. My thryoxine dosage is 150mcg every day. I take this in the morning with another yakult and some probiotics (Sona Acidophilus and Biokult). The Thyroxine dose looks like it’s just right. 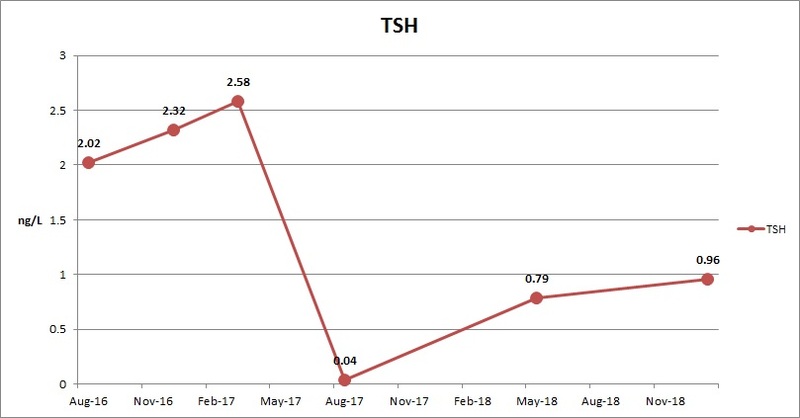 The TSH is below 1 and my T4 is just about right. You know the Thyroxine dose anyway just by how you feel. The other thing that’s changed is my Vitamin B12 which has dropped a lot. This is probably due to a combination of less meat and dropping the Berocca supplementation. I think that too much B12 might actually be a bad thing as it’s drop correlates with my red blood cell and iron count improving although correlation is not causation. The local Spanish wine seemed to have no effect on my liver enzymes which were lower if anything. Local wine is best. Anyway my blood is good.